A Louis XIV period solid Walnut Commode dating from c 1710 of shallow double bow front form. 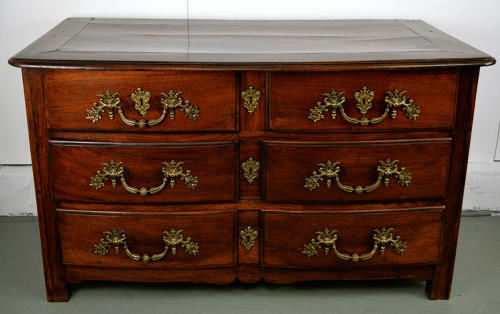 The shaped plank top above two short and two long shallow curved drawers with decorative brass handles and escutcheons, the whole resting on stile feet. Excellent condition, colour and patina with various minor marks, scratches bumps etc consistent with age and use. The handles and escutcheons are 18th Century but are not original to the piece.